The mucosa-associated lymphoid tissues continuously take up antigenic matter from the lumen to generate immune responses or to maintain immune tolerance. This antigen sampling is performed by highly specialised epithelial cells, the membranous (M) cells of the dome epithelia. M cells possess a unique ultrastructure and lie in close contact to lymphoid cells. They endocytose soluble and solid substances, including entire microorganisms, at their apical membrane, transport these in vesicles to their basolateral membrane and exocytose them to the intercellular space. This review summarises the structural and functional peculiarities of M cells in different species and at the different sites of lymphoid tissue along the digestive and respiratory tracts. Specialisations of M cells for antigen uptake and transport comprise the composition of their apical membrane and its glycocalyx, a modified cytoskeleton as compared to enterocytes and a pocket-like invagination of the basolateral membrane populated by lymphocytes and macrophages. 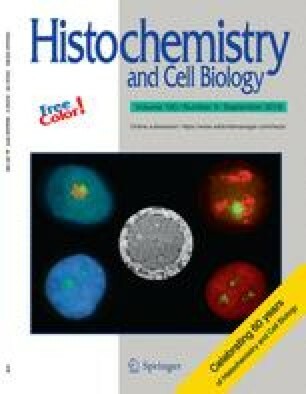 Besides ultrastructural characteristics, histochemical markers are listed that are currently available for detecting M cells by light microscopy. The origin, differentiation and distribution of M cells and other epithelial cell types of the dome epithelium are outlined. As M cells are used as entry sites by various pathogens and, in the future, might be employed for the oral application of vaccines and drugs, the clinical relevance of M cells in health and disease is discussed.